The elderberry (Sambucus canadensis ) is more often than not a shrub, but some can attain the size of a small tree. Also called common elder, sweet elder and American elder, the species grows in much of the eastern United States in moist soil. Elderberry is quick to grow but does present some problems, as the species can regenerate through its root system, creating dense and maybe unwanted thickets. The arching branches of an elderberry typically develop from a number of separate stems that emerge from the roots. The plant can be as tall as 16 feet, but most are between 6 feet and 12 feet high. The elderberry spreads out almost as wide as it is tall and in many cases you will discover it growing in groups of many plants densely packed together. That results from elderberries suckering—growing a cloned offshoot—from its own roots. Compound leaves that grow opposite each other are a feature you can use to identify elderberry. The leaves exist as five, seven or nine leaflets on a central stem as long as 9 inches. The dark green leaflets are up to 6 inches long, have toothed edges and emit an unpleasant aroma if you crush them. The flowers of the American elder emerge in July as "cymes," clusters of flowers on the ends of stalks that may be 10 inches in diameter. The white blossoms are star shaped and can become so plentiful that they cover the entire elderberry plant. The ripe berries grow in clusters; they are purple-black and each as wide as a quarter inch, each containing from three to five hard seeds. Landowners can turn to elderberry when they have ponds, streams, bogs or similar wetlands on their property that require some vegetation to control erosion or a plant that can add some visual appeal to the area. The elderberry is also suited for such purposes as roadside plantings and living screens or shrub borders. American elderberry will attract birds, bees and butterflies when in bloom. The berries are edible and are used in food products such as jellies, wine and pies. Elderberry cultivars are available to plant in moist parts of your yard. A young elderberry can be transplanted with few problems and can handle acidic or alkaline soils, so long as you place the bush in full to partial sun. The York hybrid has bigger fruit than an average elderberry and is a good choice if you want to harvest the berries for cooking. The Aurea has golden foliage that gives it visual appeal; it can grow 10 feet tall. When opting for the Variegata cultivar, plan to place it where it will get some shade from direct sunlight for at least part of the day. Pruning an elderberry vigorously can keep it and its suckers under your control, and the plant will respond positively to your efforts. 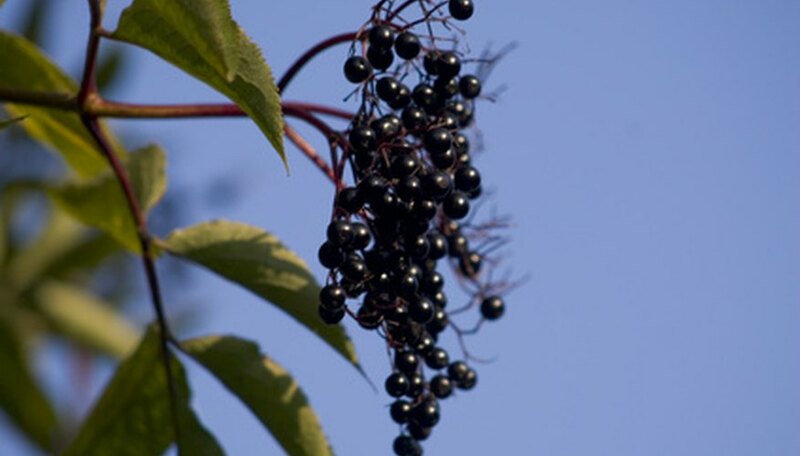 Elderberry grows from northern Maine to southern Florida and from Texas to the Great Lakes. The leaves tend to suffer from a disease known as powdery mildew, which gives them a whitish coating. The berries taste less bitter after you cook them, but birds and other wildlife will eat them from the shrub without reservations.